Very good quality. Always use these gloves as I have a latex allergy . Nice soft gloves that offer sensible protection. Used for outside work with cotton gloves inside; product is comfortable and with the inner glove, warm. Both gloves are good quality. Used for washing up and other wet jobs around the house and car, I cannot use rubber, plus the size is larger than you can purchase in the shops. Washing up and cleaning jobs. 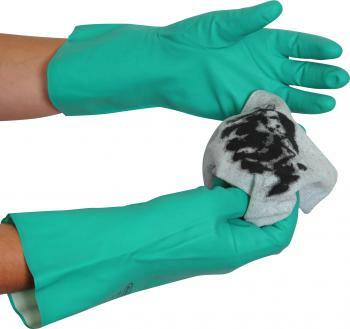 Suitable for people with allergies and sensitive skin who need a stronger glove to cope with all cleaning jobs. Found product good quality. 3. Very good quality, very durable and only fail through snagging or cutting. Car washing - have not used yet but look OK. These are my washing up gloves. I am allergic to latex 'Marigold' type gloves. Anyone who needs non-latex household gloves. The quality is excellent. I have given them four stars not five because they need to be longer and have a rolled cuff like Marigolds. There is a tendency for water to get back down the cuff. The Gloves are good quality and used everyday in our line of work. For preparing food or touching things that would irritate my skin as I suffer from contact demititus, I think these are a good glove for the price, however they could do with a bit more cotton lining in (don't put cream in as some have done because causes hands to sweat) that is my opinion because I suffer. With a little bit more of the cotton lining where the glove as a whole touches your skin would be amazing. Unless you suffer yourself it can be difficult for others to understand. However there are a lot more people (at home) or in the work place that are becoming more allergic or having and intolerance to different products on there hands when having to use for quite long periods. If you you can find something to help with these different situations it would be a win win win! For all. People are becoming more sucepible to alsorts these days and I can't seen it going away anytime soon. Nice light Nitrile gloves. Very comfortable and serviceable. I use for general purposes, washing and cleaning beekeeping equipment. Ideal for use when washing flowerpots and cleaning the pond. Good quality, used when installing acoustic enclosures on site. Use the product for household chores. Would recommend nitrile gloves to anyone allergic to rubber. Good quality goods, as advertised, of a good size (I have large hands). Arrived promptly. I use flock lined nitrile gloves around the house as I have a latex allergy. I buy in bulk so I don't run out and can have them in the kitchen and all of the bathrooms. Great price. I would totally recommend them as the are comfortable to wear and last really well (as long as you don't put a hole in them which is my usual trick but not the fault of the gloves!). Great service, great gloves and a great price - what's not to like? Gloves ideally need to be gauntlet length, able to withstand bee stings and be washed in washing soda to remove propolis/wax. Also need to be sensitive enough to not squash bees when handling them. we were struggling to find extra large gloves for father with poor hands. these are idea very roomy and good for washing pots etc. As above good value and long lasting. Used for dirty tasks and would recommend to other eczema sufferers. Quality is excellent. I am allergic to many things and these gloves are excellent for me to use when washing up. Great for household or work use. Used for washing up and kitchen cleaning. Far far better than the yellow marigold gloves. I use these for dishwashing and so far I'm really satisfied with their quality. Actually they last longer than the previous pair of more expensive black rubber gloves I used to use. The grip is good. Are a good choice for dishwashing. In using the the gloves I purchased I am more than pleased with them. I found the quality of the product to be first class and would reccoment them to my friends. Very useful strong economical gloves for working on wet dirty jobs eg kitchen drains, garden plants etc. Cleaning the car at home. My husband uses the gloves for washing up and doing odd jobs around the house. As the gloves last along time. Needed latex free gloves and these were very reasonably priced. They're a little larger than those I usually purchase but not so big that I'd go down a size next time. The extra length in the sleeves is excellent protection for those jobs which use harsh chemicals. Used for general work on boats and car. Comfortable and reasonably hard wearing. Used for general dirty jobs around horses! Very good sturdy gloves and true to size. I would recommend this to anybody who do's a lot of washing up. They look great. I have bought them for beekeeping, as I had read a number of reviews recommending them. Sizing guide was accurate and gloves fit and feel good. I use the gloves for cleaning because I suffer from eczema and would recommend them to anyone else in the same situation. Use for washing up. Great product. Very comfortable.